#Tinder typo, or unfortunate #Norwegian realtor domain drop? :DomainGang #Tinder typo, or unfortunate #Norwegian realtor domain drop? 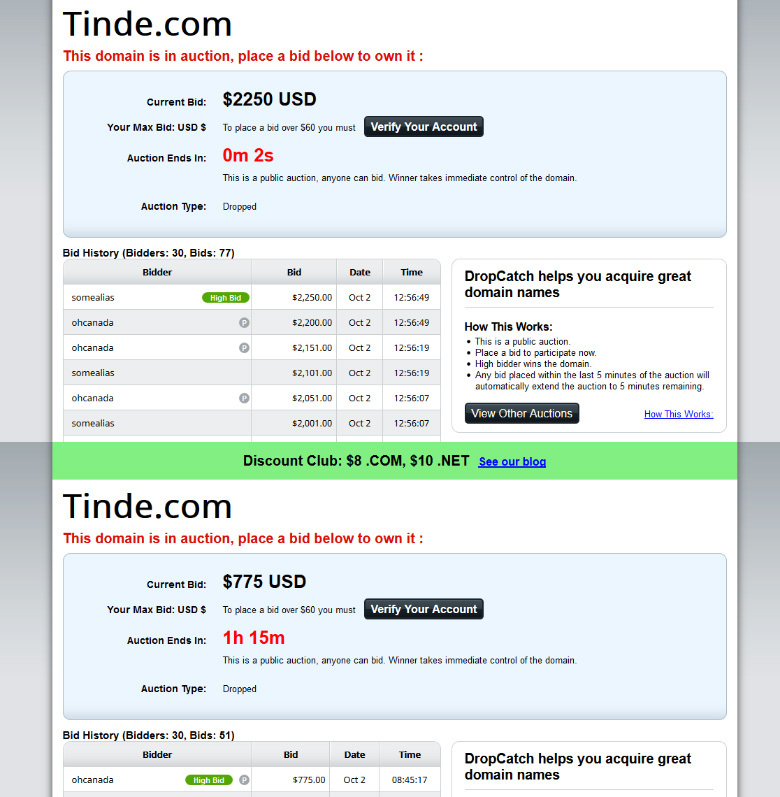 The domain Tinde.com was auctioned off at DropCatch today, after some healthy competition. It’s interesting to note that in the final 75 minutes of the auction, the bids shot up: from $775 dollars, to the final winning bid of $2,250 dollars. Why did 30 bidders place 77 bids total for a – supposedly – Tinder.com typo? The fact is, that Tinde.com was used by a Norwegian real estate listings web site, which was forwarding it to the matching ccTLD dot .no. But Tinde.no does not resolve, and it’s most likely the reason why Tinde.com dropped: the registrant and admin emails of Tinde.com were linked to Tinde.no. The Reberry brothers win again! Tinde means mountain in norwegian..